ORIENT PUBLICATION: Asha Bhosle launches Padma Wadkar debut album Morey Piya at Juhu. 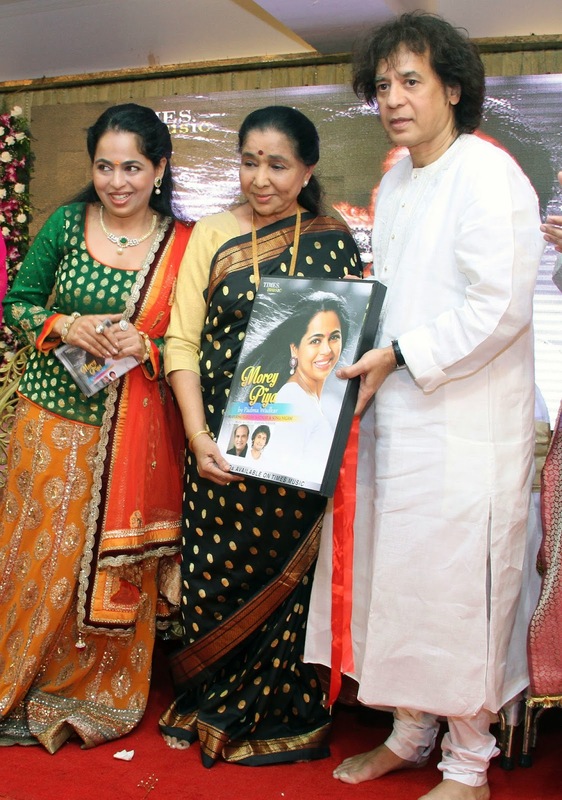 Asha Bhosle launches Padma Wadkar debut album Morey Piya at Juhu. Padma Wadkar launched her debut album Morey Piya recently in Mumbai which also features Suresh Wadkar and Sonu Nigam.Asha Bhosle and Zakir Hussain officially launched her album.Padma Wadkar told media that She began recording Shreyas Puranik songs couple of years ago.Did not realise when I got hooked.And the addiction was fast growing.His combination of new age rendition with simple,straight from the heart lyrics made me want to record more and more of his work.Suggestions came from all corners that we should cut an album.But I was not convinced.Albums felt like something of the past and yet, God had willed it otherwise. Morey Piya is a documentation of our musical journey over the last three years.The album is released through Times Music.